One of the joys of browsing in a real, rather than online, bookshop is coming across a brilliant book on a subject you’d never think of reading about. So I was chuffed to discover Map Addict by Mike Parker, published by Collins, during a holiday visit to Waterstone’s in Dorchester, Dorset. I’ve blogged before about my love of maps and the map’s evolution from a printed sheet to an icon on a smartphone. Parker’s book brought back many more memories – such as the lack of any photo on the cover of the original Ordnance Survey maps that replaced the much-loved one inch series. And the fact the 1:50 000 series index map, showing which map covered which part of Great Britain, was cut by a line across the country indicating that the northern maps would only appear two years later, in 1976. Mike Parker is a fan of Ordnance Survey. He was obsessive as a schoolboy collector of the original OS 1:50 000 series, resorting to shoplifting to complete his set. As I blogged before, my oldest surviving OS map is a 1:50 000 map of the Rhondda. Its age is betrayed by the lack of Welsh names for places like Bridgend and Neath. And the absence of the M4 motorway, whose future route is indicated by blue dashes, which I converted to a solid blue line with a schoolboy pen. And, as Parker would point out, this map pre-dated the branding of the 1:50 000 series as Landranger in 1979. I did once possess one of the last one inch maps, sheet 154, Cardiff. Years later, I picked up a one inch map of Cirencester at, of all places, Kemble railway station. It was fascinating to plot the way the town had changed since the early 1960s. The old Midland & South Western Junction Railway and GWR lines had disappeared. The original by-pass had opened. Mike Parker tracks a similar change in Winchester, where the controversial M3 bypass led to the obliteration of the 1930s Winchester by-pass – a rare example of a road rather than a railway disappearing from the face of the earth. Mike Parker also relished the memory of ‘Flintshire detached’ in the same way as I did as I recalled on the 40th anniversary of the end of this exclave. But he trumps this example of an untidy border with the case of Baarle: five kilometres inside the Netherlands, it contains 21 exclaves of Belgium, which in turn contain nine enclaves of Holland. Back to old maps. The one above is less than thirty years old. 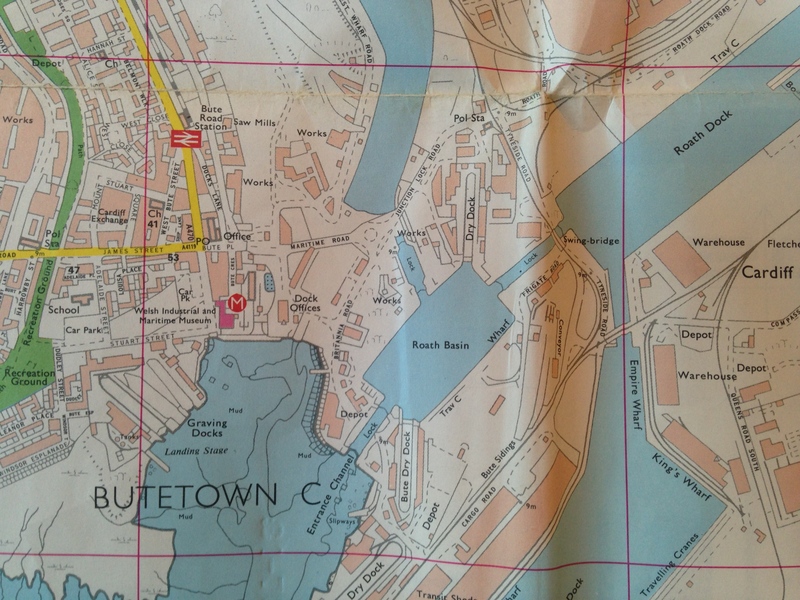 It’s the OS City Map of Cardiff from 1985. This is a section showing Cardiff’s famous Tiger Bay docklands before it was transformed into Cardiff Bay. The Norwegian church is still in its original location. The maritime museum – a favourite of mine – is still in place. (Mermaid Quay now occupies the site.) The National Assembly was a distant dream just six years after Wales rejected devolution in the 1979 referendum. 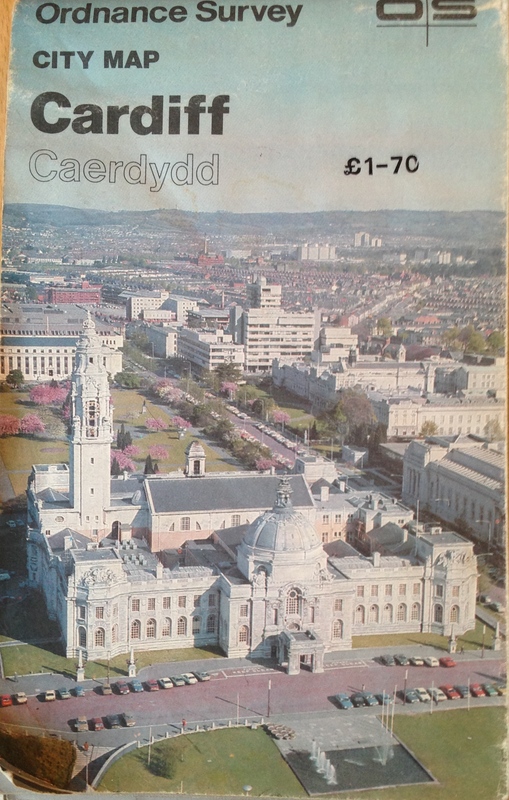 That 1985 map uses the classic view of Cardiff’s beautiful civic centre on the cover. A 2014 version would probably feature Cardiff Bay or the Millennium Stadium. I’ll finish with my first big bike ride, from South Cerney near Cirencester to Cardiff in 1994: 20 years ago this month. It was much tougher than I expected because of the headwind. (Lesson learned: always cycle west to east in Britain because of the prevailing wind.) 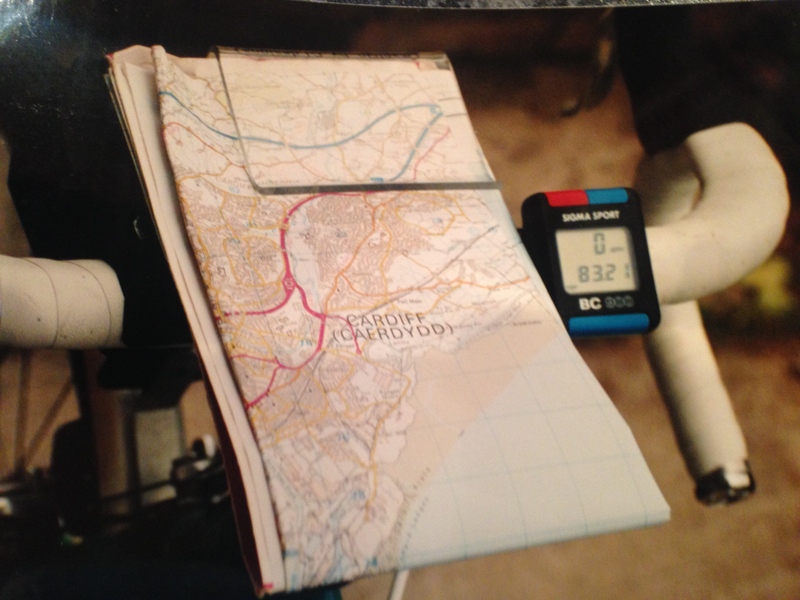 I took this photo when I arrived at Mum and Dad’s house in Lakeside, Cardiff, after an 83 mile ride. The OS maps proved brilliant except during the last leg through Pontprennau, thanks to the then new housing development that rendered my map out of date. Tonight, I’m raising a glass to Ordnance Survey, the world’s finest maps. Thanks to Mike Parker for the prompt! 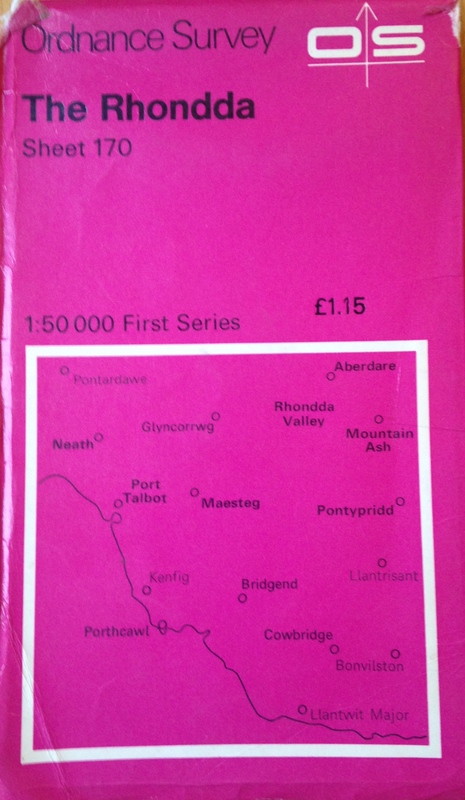 This entry was posted in Books, Britain, Wales and tagged geography, maps, Mike Parker, Ordnance Survey by Rob Skinner. Bookmark the permalink.